Lindsay and Taylor of Love & Olive Oil and Julie of The Little Kitchen hosted the The Great Food Blogger Cookie Swap for us food fanatics. Nothing screams Christmas except cookies. 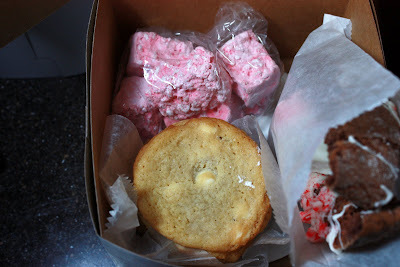 Each person was assigned three bloggers to share their cookies with. 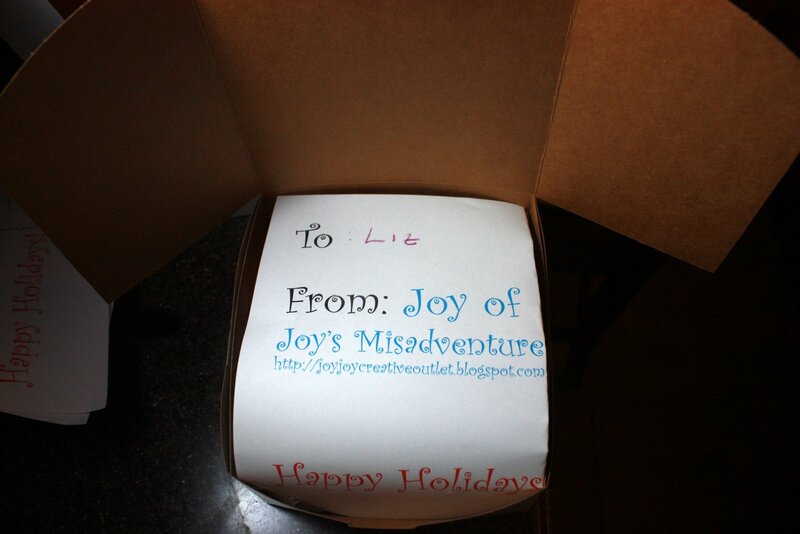 I unfortunately had to share with a few more people than expected, like The Kids and Husband. Instead of making just one type of cookies, I made three. 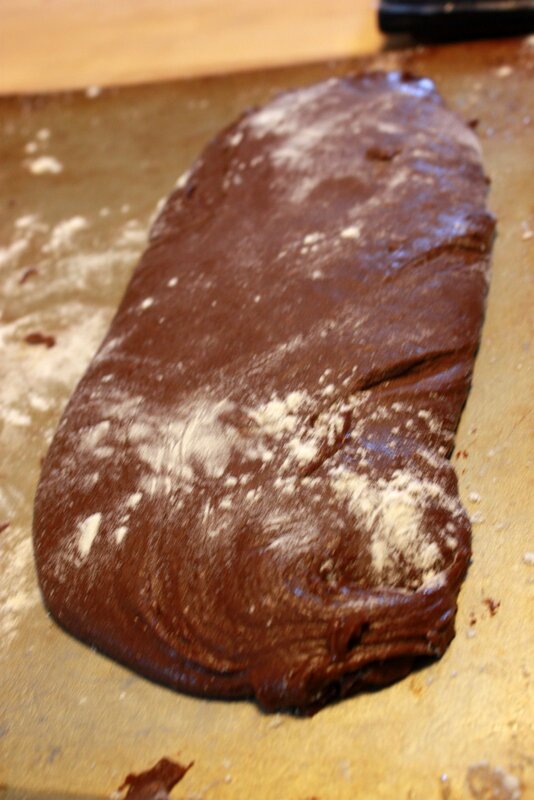 The main cookie I made was a brownie biscotti. 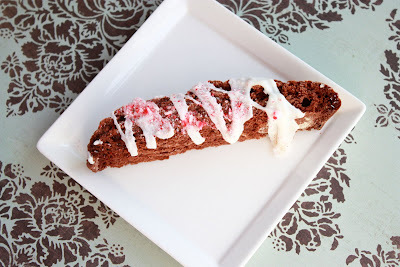 I always wanted to try to make biscotti but I never had a chance. It was on my “try” list for quite some time. I have always sucked at cookies (I have no idea why, I could make breads and macarons but my cookies always fail). I’m “special”. One day I will be able to make cookies without help, one day. I used the help of some brownie mix. I'm counting this as remake #3. Whip together the whole egg and egg whites. Add the mint to the egg mixture. 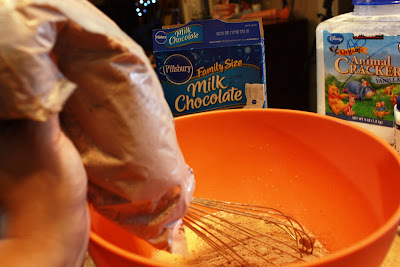 Take 1/2 of the batter and pour it on the counter covered in flour. Slowly mix in more flour until it becomes stiff enough to holds it shape. Form the batter to a flat log, about 7x3. Place on a prepared cookie sheet. Bake for 20 minutes or until it is fully cooked. Remove from the oven and let it cool for 5-10 minutes. Slice the dough into 1/2 inches slices. 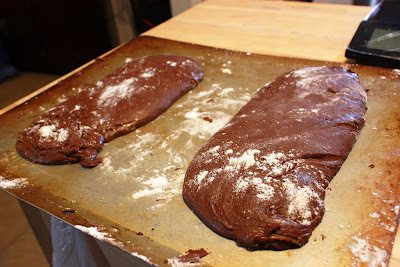 Place on the cookie sheet again and bake on each side for 7 minutes. 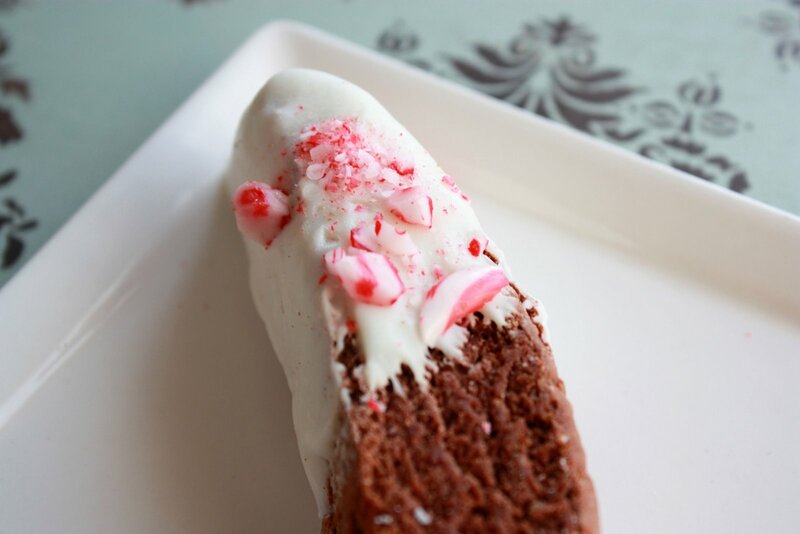 Start melting the white chocolate until it is smooth enough to coat the biscotti. 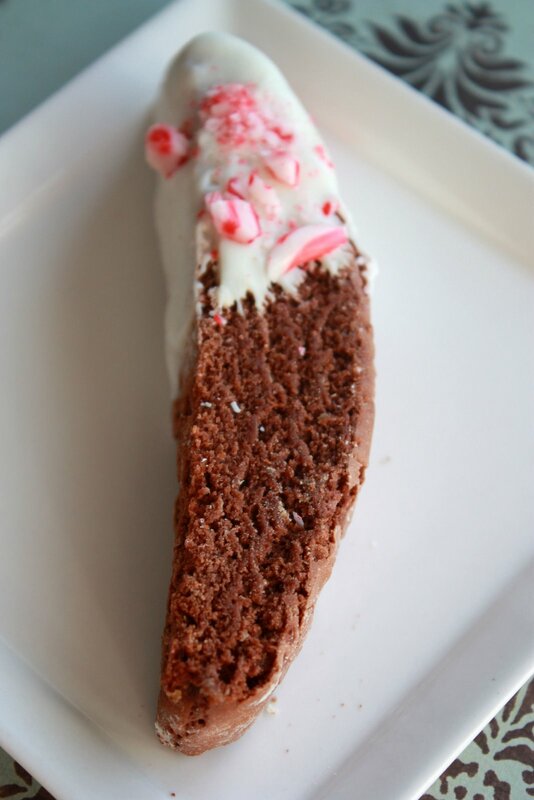 Sprinkle with crush candy canes and serve or pack. I would make it the same thickness or it will not bake evenly. I made a set of the biscotti to test the recipe and it made about 2 dozen. One of the ingredients I needed got eaten by a little “mouse” when I wasn't looking. You could probably guess who got into it. The same mouse got in the other ones and ate the candy canes on ½ of the batch. I wasn’t too happy. It is my fault. I should have watched her. I wish I had more time or I would have made more. But I wanted to add another little gift. I made some marshmallows but I made a reverse rice krispy treat. 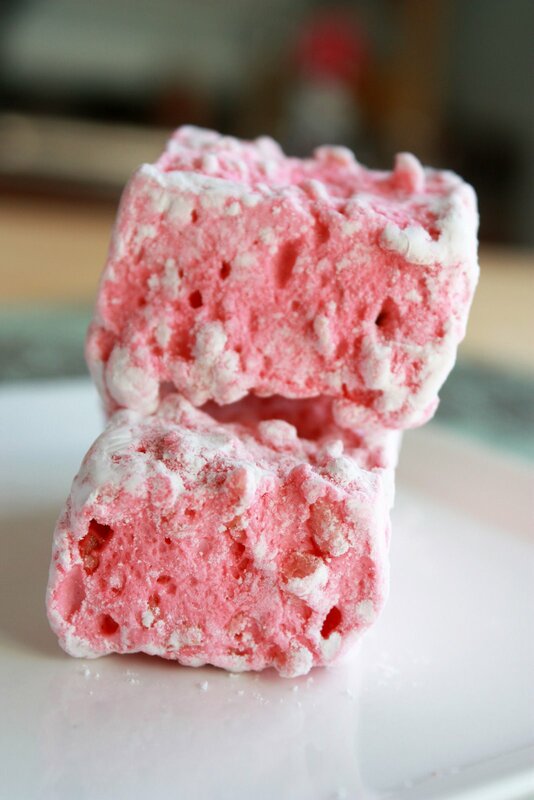 I used Martha Stewart's Strawberry Marshmallow recipe. In the final minutes of mixing, I added 2 cups of rice krispy cereal. I know I'm strange. I kinda made The Daughter feel bad about eating the cookies that she demanded making more. It is good I had some leftover keylime cookie dough one of my cousin's guilt tripped me into getting (I just love the school fundraisers). 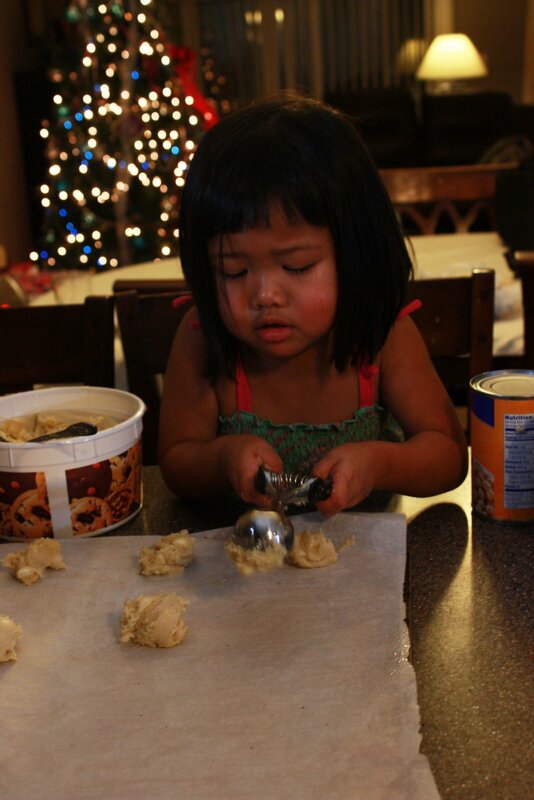 She was so concentrated I couldn't stop her until she finished up all of the cookie dough. 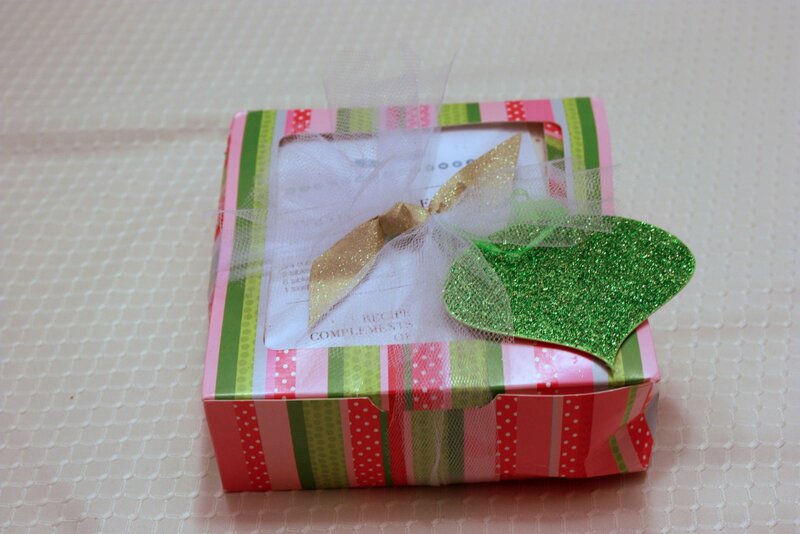 This is one of the packages I received. Unfortunately, someone also attacked these cookies and it wasn't the same little mouse. 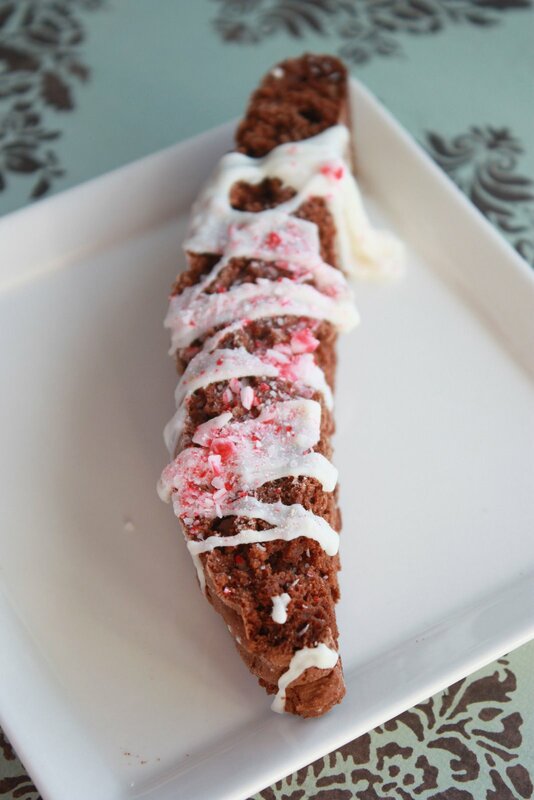 Joy- Your biscotti looks so good, and I love your reverse Rice Krispy treats. The picture of The duaghter is precious. That looks great!! I love peppermint, what a creative way to use it! Thanks! I swear the munchkin gets into everything. WHat beautiful biscotti ! Sounds so yummy! @beth and vanillalemonade - thanks!